Cedric Hählen on his successful expedition to Kanchenjunga in May 2011. That's an interesting little spot for the Polaris and just the kind of situation it was designed for - tight spaces in high places. 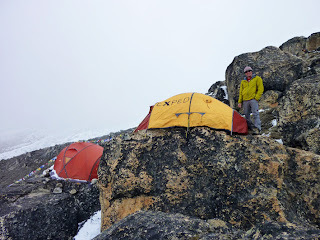 On the ledge below is the Exped Pegasus, a 4-person geodesic dome designed as an expedition basecamp tent - big and strong. Pegasus will be available in North America in 2012.